Explore the ancient history of this exotic destination, from the most familiar symbol of the Inca Empire Machu Picchu to the wilderness of their mountains and lush rainforests. Tour the cobblestone streets of Cusco on of the oldest Cities of the Latin American continent. Travel to Lima a historic and modern City known in ancient times as the City of Kings. Marvel at the highlands with snow covered Peaks 4,300 meters above the sea level. Experience the Sacred Lake of the Incas Lake Titicaca with it's floating Islands and ancient traditions. Since you are there why not add a side trip to the Nazca lines to complete this fascinating adventure of a lifetime. Ready to plan your Peru journey? E-mail us at: mytrip@platinumholidays.com or 1-855-238-0118. 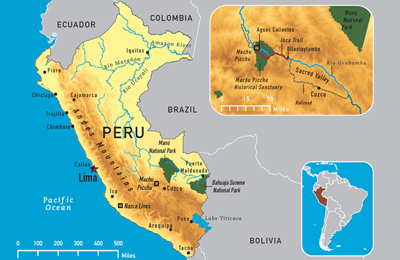 Although people often think of Peru in terms of the Inca Empire and the subsequent conquest by Spain, there were many different cultures that predated the Inca Empire. There are a number of sites that can be visited to learn more about them. The country has had more modern influences on it as well, such as from the great number of Chinese and former African slaves who made their home here. For those interested in adventure, the country is a trekker's paradise. Many of the must-see locations offer an opportunity for hiking as well. There are a few different treks that incorporate visits to Machu Picchu, for example. Colca Canyon, located near Arequipa, also has a trekking option. In addition to trekking, there are many places that one can horseback ride, whitewater raft and mountain bike. In Huacachina, you can ride a dune buggy by a lagoon. Along the coast, you can parasail and surf as well. You can spend time in Lima, a cosmopolitan metropolis, or visit small communities where the people are still living as they have for generations. History comes alive in these places in a way that's hard to find in many other countries. Gastronomic enthusiasts can go on a dining tour of Peru. Lima has been called the gastronomic capital of South America with many types of cuisines, traditional and fusion. Arequipa is well-known for it's deep fried guinea pig and stuffed peppers. Chicharrones, deep fried pork rinds, are a popular item in many areas of the country. And Ica, the home of the national drink, pisco, is a great place for sampling various brands. Everywhere you go, you'll find samples of the local handicrafts. Although these tend to be concentrated in the areas of ceramics and textiles, you'll find that each village seems to have a slightly different style. You may even want to bring a long an extra bag just for all the things you want to take home with you.